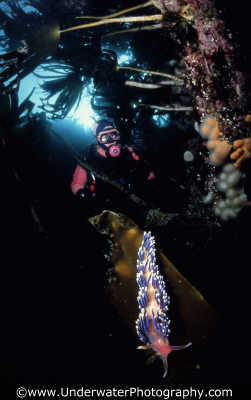 The weather is always a factor for the diver and is also of great concern to the underwater photographer. Whilst a spot of bad weather will not curtail enjoyment for the average diver the underwater photographer needs a specific set of conditions above and below in order to get the best possible shots. Wind is always the biggest surface factor to consider for the diver and underwater photographer alike. It is easy to be discouraged from taking a camera in when the boat is rolling about in a ten foot swell especially when followed by long chase boat rides which sap your energy. Of course you can stack the odds in your favor and only dive abroad. Warmer water makes photography a lot easier and usually has more interesting species. However, you will inevitably come up against adverse conditions one day and it is best to be prepared. Wherever in the World you are diving, water quality is fundamental to underwater photography and should be considered carefully. Visibility is arguably the most important water quality factor of all. If visibility is good then life is a lot easier than when it isn't! Be optimistic that it will be good but prepared for it to be bad. Work close to your subject and keep you strobe away from the lens. Water temperature can also make the difference between hard work and easy results. Cold might not stop you working but it will slow you down and reduce bottom times. Few aspects of water quality can be totally anticipated. For instance, unless you are in mild tidal waters (like the Mediterranean) currents can only be assessed once you reach the dive site. Nothing frustrates the underwater photographer more than being unable to maintain position. Some of the dive stores in the Pacific sell a buddy line with a meat hook on the other end. The idea is to clip the line to you and use the hook as an anchor. However, you know you're in trouble if you arrive at your resort and see everyone else on the boat with one when you haven't got one! Stay optimistic, big currents usually mean big fish and big fish make great subjects.